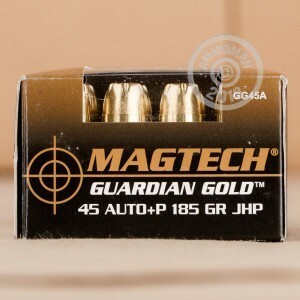 This high pressure .45 ACP ammunition from Magtech's Guardian Gold series propels an 185 grain jacketed hollow point bullet to 1,148 feet per second. For guns capable of handling the +P load and its associated recoil, this configuration offers the best of both worlds, combining the accuracy and penetration of the 9mm with the high caliber and mass of the .45 Auto. An excellent choice for full-size pistols like Government length 1911s in particular! Magtech ammunition is manufactured by Brazilian defense contractor CBC, which also produces its own components for maximum quality assurance. Guardian Gold uses non-corrosive Boxer primers and brass cases. 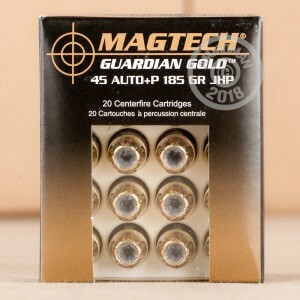 From inexpensive range ammo to premium defense hollow points like these, AmmoMan.com has your ammo needs covered. Place an order for $99 or more to qualify for free shipping!